For many of us, our dreams often involve earning enough money to travel the world or retire in style. But for Elizabeth Pospa, her dream, which has been on her mind for decades, is nothing close to anything cushy or luxurious. 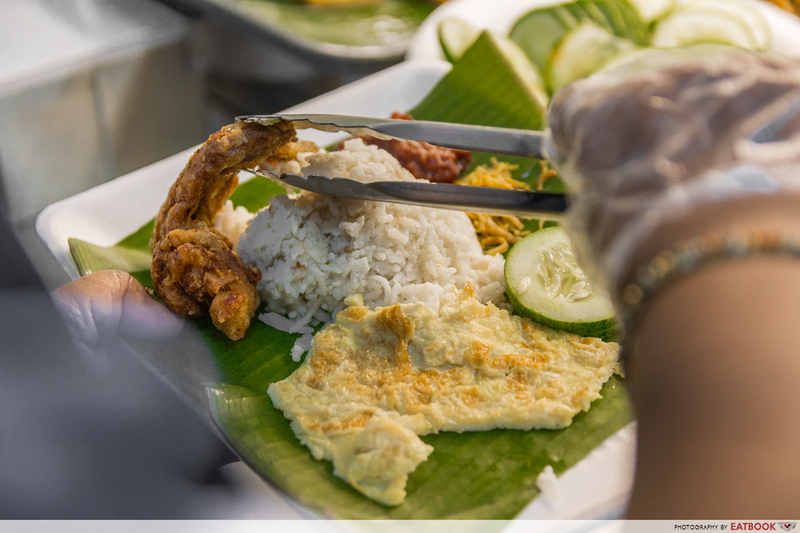 After working as an immigration officer for over 20 years, Elizabeth, 55, who has always wanted to sell food that she loves, took the leap of faith last year to resign from her job and start her own nasi lemak stall, KR Banana Leaf Masala Chicken Nasi Lemak. The passionate lady’s dream became a reality when she decided to try for the Tiger Street Food Support Fund 2017. 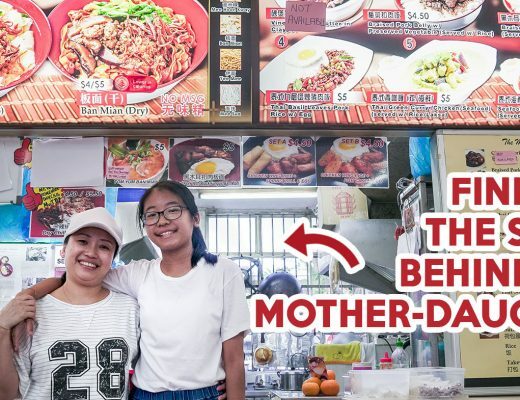 With her “sedap sambal” that she spent years perfecting the recipe with her mother, Elizabeth impressed a panel of judges from Tiger Beer and received a grant which gave her the financial means to start a hawker stall. The process – from the moment the judges gave their thumbs-up, the filming of short videos, and being part of the Tiger Street Food Festival 2017 – also gave her the confidence she needed to start out on her own. It is common to see the wet market vendors at Chinatown Complex Market setting up their stalls in the middle of the night, and Elizabeth joins the group of early risers as she starts preparation at 3:30am every day. 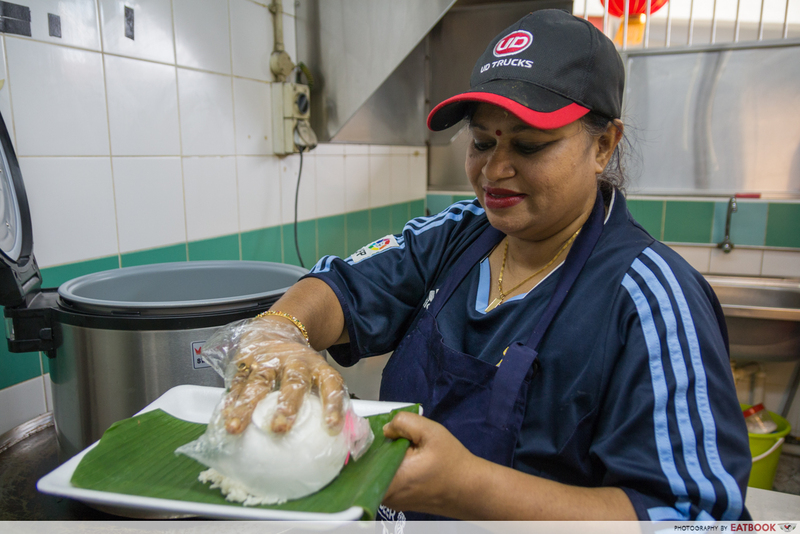 For three hours before her stall opens at 6:30am, she single-handedly whips up various ingredients for her nasi lemak and Roti Prata ($0.80 per piece), which she serves as a breakfast item from 6:30am to 10:30am. When asked if switching to such a physically taxing job was difficult, her reply took us by surprise. 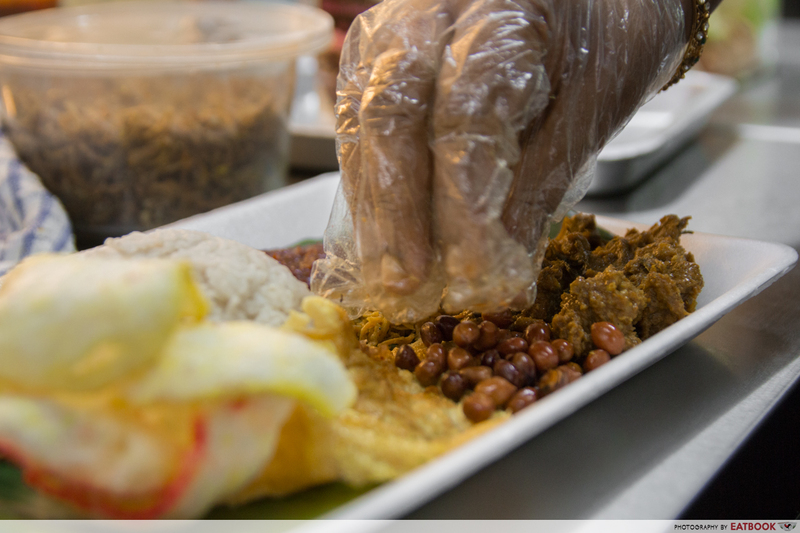 “Not difficult at all lah, I am finally living my nasi lemak dream so I am very happy,” she said. Motivated by her passion for serving good food, challenges such as the tedious process of food preparation and the uncomfortable work setting are no sweat to her. In fact, she prides herself on the experience and skills she acquired from her many years of cooking. While working as an immigration officer, Elizabeth spent most of her free time helping out at her mother’s food stall and tweaking the recipes with her. 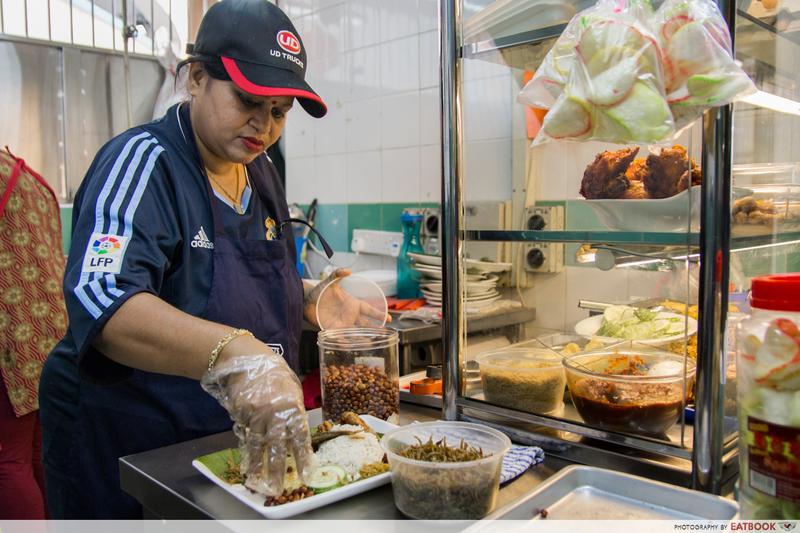 Shortly after she finally became satisfied with her “sedap sambal” recipe, she came across the Tiger Street Food Support Fund, and was convinced that it was still possible for her dream to be fulfilled. Having always had the heart, the $10,000 and the boost in confidence given by Tiger Beer was what gave her the means to finally get a stall at Chinatown, purchase the equipment required, and start her own business. 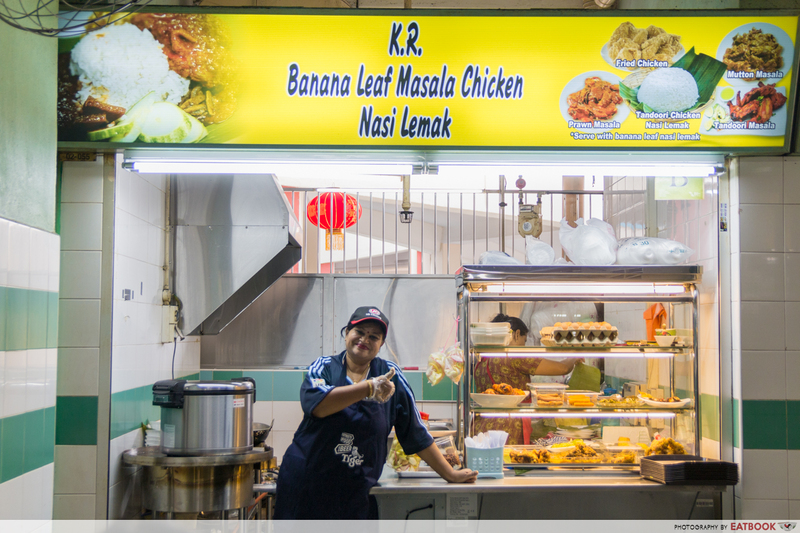 With over 200 stalls in the food centre, KR Banana Leaf Masala Chicken Nasi Lemak did not stand out initially. Hidden at a corner of the food centre, the stall was minimally designed, with only a few ingredients on display. When we ordered our food, however, we were hit by the fragrance that wafted out from the stall when Elizabeth lifted the cover of the rice cooker. 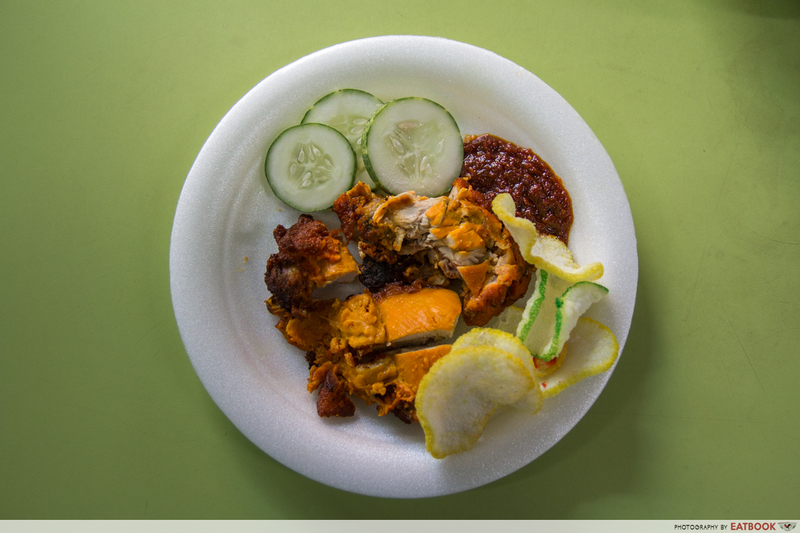 When we asked for the simplest meal she serves, Elizabeth prepared her Fried Chicken Nasi Lemak ($3). 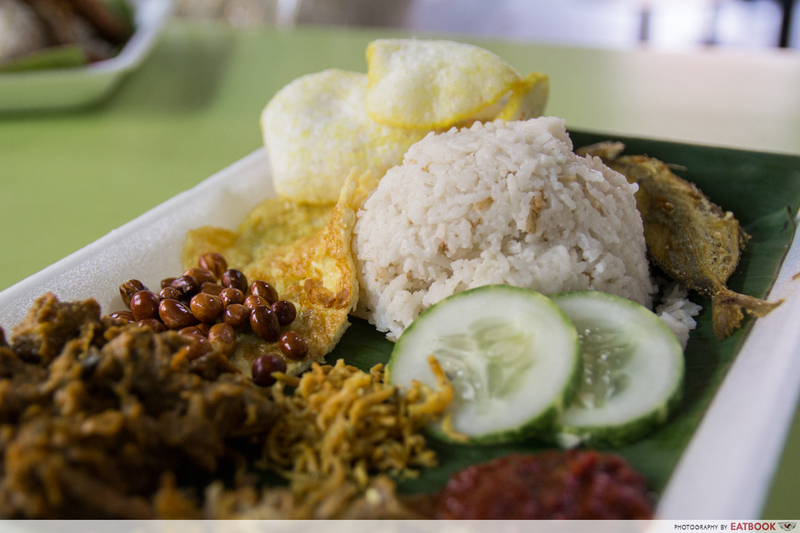 While most nasi lemak sets that come at this price will comprise only three to four sides, you can expect more here. Aside from the usual coconut rice, omelette, and fried chicken, the set also came with two types of fried ikan bilis, peanuts, keropok, and a generous spoonful of Elizabeth’s signature sambal. With only a slight hint of spiciness, the sambal was overall sweet, savoury, and addictive. We weren’t afraid to mix all the sambal up with our rice and Elizabeth was more than happy to give us even more of it to go with the other ingredients. 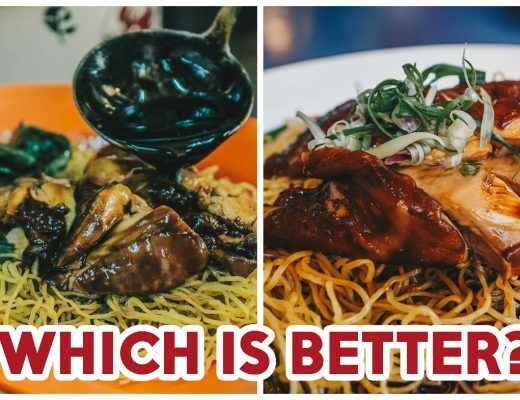 With roti prata at $0.80 and nasi lemak at $3, this stall offers relatively affordable food at Chinatown. When we asked about that, Elizabeth simply said that her main aim is to let people enjoy the food, so she doesn’t mind selling them at a lower price. What makes her the happiest is that she is finally living her dream of serving her favourite food to people and her only wish is to be able to serve a wider variety. Another speciality that we tried, which was also our favourite, was Elizabeth’s Masala Chicken ($4). Marinated overnight and cooked upon order, the chicken was tender with a slight crunch from the charred skin. Looking to provide a slightly healthier alternative, Elizabeth is thinking of grilling the chicken in the future instead of frying it. “I also plan to serve other sauces to go with the masala chicken, like my green mint chilli – very shiok shiok one!” said Elizabeth. 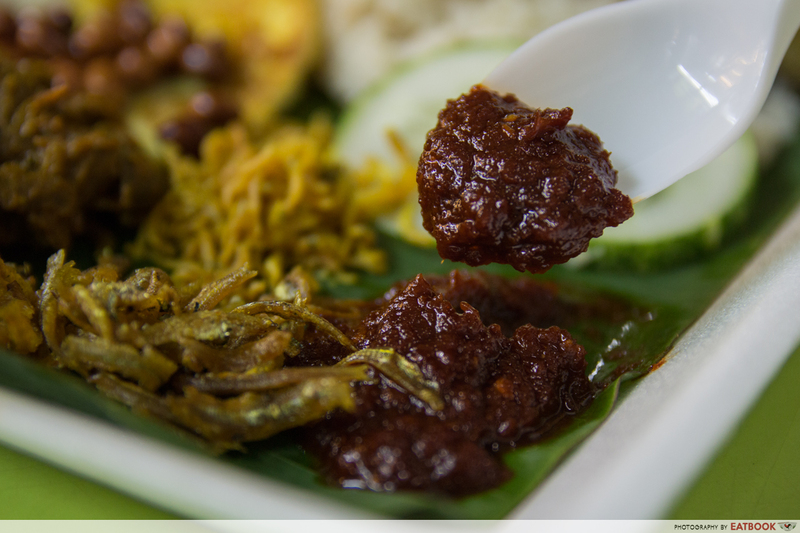 Another nasi lemak dish that you can find at the stall is the one that comes with Rendang Mutton ($4). On its own, the rendang mutton was a little salty but went well with the rice. For those who prefer non-fried items, this makes a good alternative to the fried chicken. 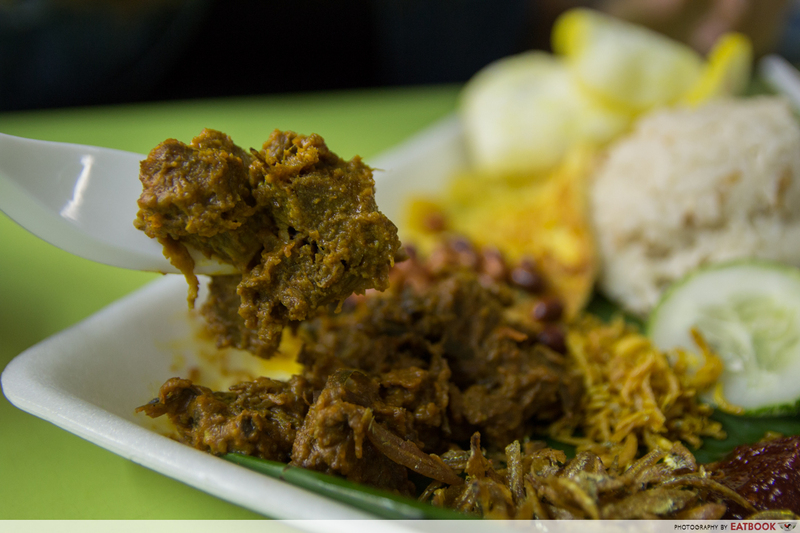 Although the portion of the rendang mutton was small, mixing it up with the rice and other ingredients still made a hearty meal. KR Banana Leaf Masala Chicken Nasi Lemak was only five days old when we visited but there are no signs that it is a newbie. From the preparation of food to the way Elizabeth served her customers, it was clear that she not only knew what she was doing, but was enjoying every moment of it. Even though Elizabeth offers a simple menu, it is still always heartening to see more of such inspiring hawkers joining the trade, and pursuing their dreams regardless of age. 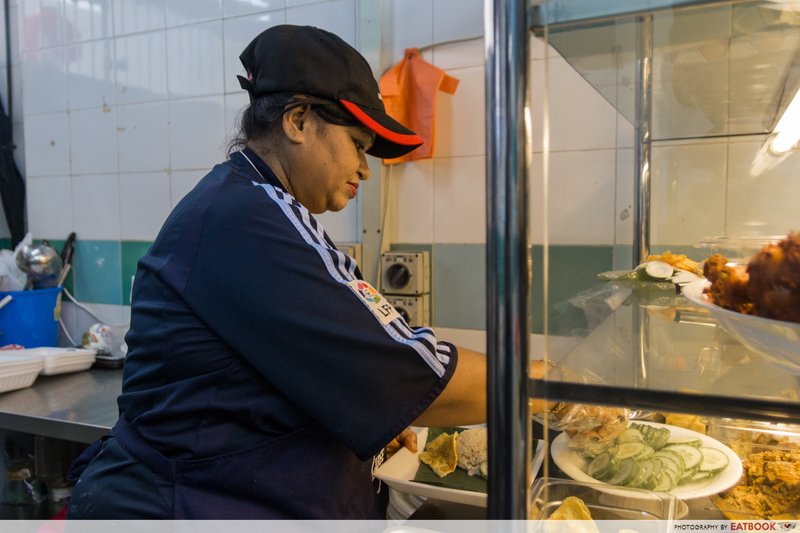 A chosen hawker of the Tiger Street Food Support Fund 2017, Elizabeth was given a $10,000 grant to start her business. This fund was started by Tiger Beer in a bid to relieve the financial burdens of aspiring or current hawkers who have their heart in this business, so as to promote and support the continuation of the hawker trade. 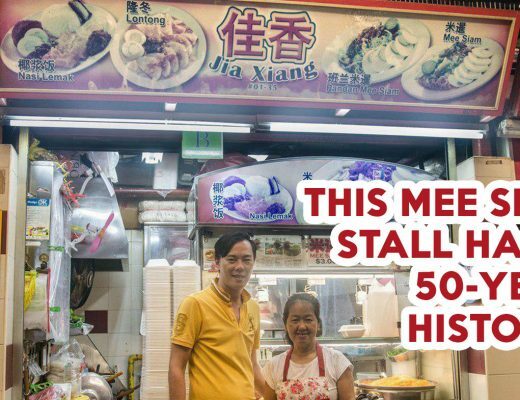 Check out other hawkers who are new to the trade or young hawkers such as Au Tai Yang who traded office jobs for the hawker life. 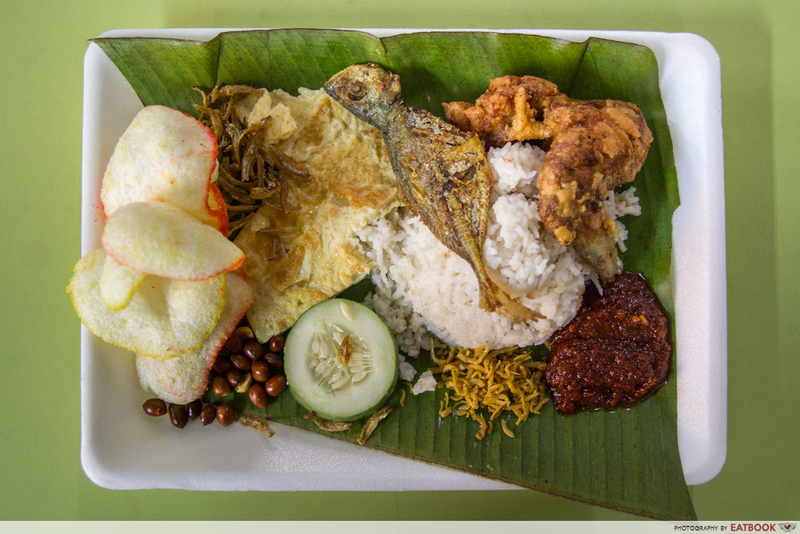 KR Banana Leaf Masala Chicken Nasi Lemak is not a halal-certified stall. This post is brought to you by Tiger Beer Singapore.